Welcome to my first official give-away! Bring your friends over in droves! This deserves a *celebration*! A FIFTY DOLLAR GIFT CERTIFICATE TO THE VINTAGE PEARL! 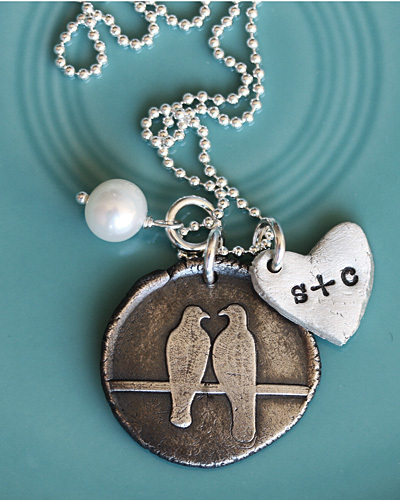 Not only does The Vintage Pearl make exquisite hand-stamped jewelry and keepsakes, but she also sponsored my ticket to The Relevant Conference, which was a keepsake of its own. Now, I don’t want to sway your opinion or anything, but I’ve gotta show you my all-time favorite piece. Sigh. Now, if that doesn’t wrap up a good two-week Marriage Series, I don’t know what does. Here’s what you can do to win the $50 Gift Certificate. Leave one comment for each thing you do! * Visit The Vintage Pearl and tell me which piece caught your eye! * Share this give-away on Facebook! * Buy something from The Vintage Pearl! Meet up with her: www.thevintagepearl.blogspot.com or @thevintagepearl. Now, get to work, my friends! You have until Friday, November 12th at 6 a.m.! I’ll announce the winner on Friday morning. Subscribe, so you’ll be in-the-know right away!